Needlepunch MultiSport synthetic surfacing is popular for sports facilities in UK schools because it is versatile enough to be used for a lot of different activities, as well as being soft and absorbing impact so younger children can play on it safely. We carried out a MultiSport synthetic MUGA construction for a primary school in East Ayrshire to improve their existing play surface and create an all purpose facility. For this MultiSport synthetic MUGA construction project, we started off by preparing the existing ground and excavating down to the right depth for the rest of the installation to take place. 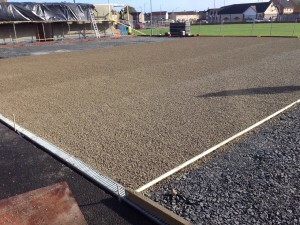 We then had to install a specialist sports sub base made up of porous angular stones which lock together creating a stable and strong foundation for the needlepunch synthetic turf to be laid out onto. When the stone sub base layer had been installed and compacted, the next part of the MultiSport synthetic MUGA construction was to put down the synthetic turf surfacing itself. The school chose to have a fibre bonded needlepunch surface installed for their play area as this is a versatile specification which can be used for many sports including football, tennis and hockey, as well as general all weather play activities. The woven carpet also provides a soft, impact absorbing surface for the kids to play on so the risk of injuries is reduced and the environment is kept as safe as possible for use in PE lessons, break times and extra curricular clubs. The green needlepunch synthetic carpet was rolled out in separate pieces and then joined together at the seams and the perimeter with a specially designed sports pitch glue to secure the carpet. Red synthetic turf was then installed around the edges of the playground to give the area a more interesting look. 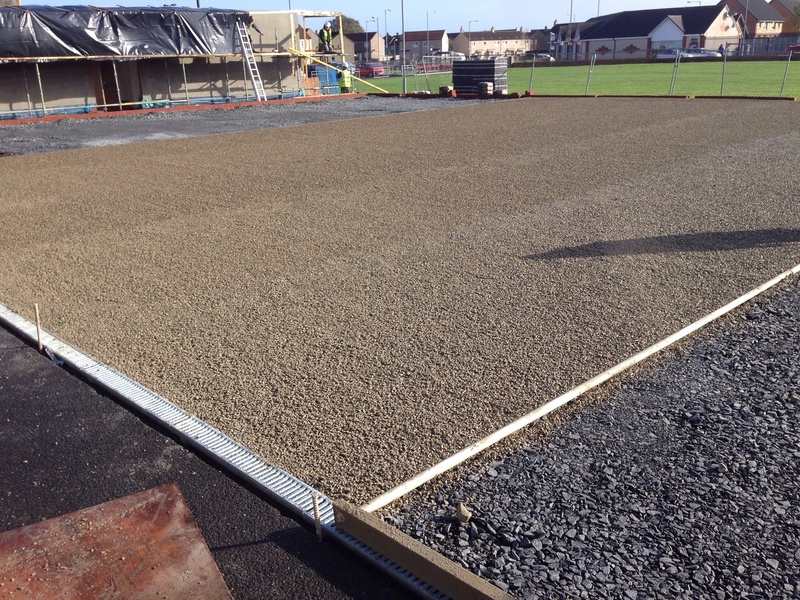 A layer of silica sand infill was then installed within the artificial turf fibres to enhance the performance and stability of the surfacing. When the needlepunch surfacing installation was complete, the school ended up with a brand new top quality playing surface which they can now use for sports and other recreational activities. The students and staff are extremely pleased with their new facility and will be using it for a wide variety of sports and games both during school and outside of school time. If you’d like to discuss a MultiSport synthetic MUGA construction project at your school, nursery, college, sports club or leisure centre, please feel free to fill in our contact form with your details and what it is you’re looking to install. We have carried out many similar projects to this all over the UK and we would be happy to offer you an accurate price quotation for your enquiry. Our experienced team can help you with all aspects of the process from designing the perfect sports or play facility for your organisations to then installing the surfacing and extra features for you. 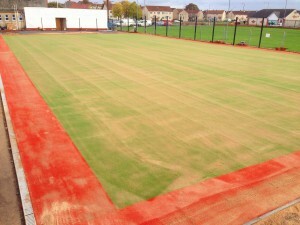 Please take a look at our website on www.sportsandsafetysurfaces.co.uk to find out more about the sports pitch products and services we have on offer. Don’t hesitate to leave us a question in the comments below if you have and problems or queries in regards to MultiSport synthetic MUGA construction or any other sports pitch related products. We will be happy to offer you some professional advice to help you with installation, maintenance and extra equipment for your facility.